LOCATION This family home is located in a peaceful cul de sac overlooking a small green and is only a short walk from local shops and Littlehaven station, which has regular trains to London Victoria and London Bridge. The property is also conveniently located for easy access to the A264, A24 and M23. Horsham Town centre is just over two miles south, offering a wide range of national and independent traders as well as a thriving café and restaurant culture. PROPERTY The front door opens in to a Porch, which offers the ideal space to remove your shoes before stepping in to the house, and has a door opening in to the WC. The Living/Dining Room is double aspect, overlooking both the front and rear gardens and is a fantastic open plan space, measuring 26’9″ in length. 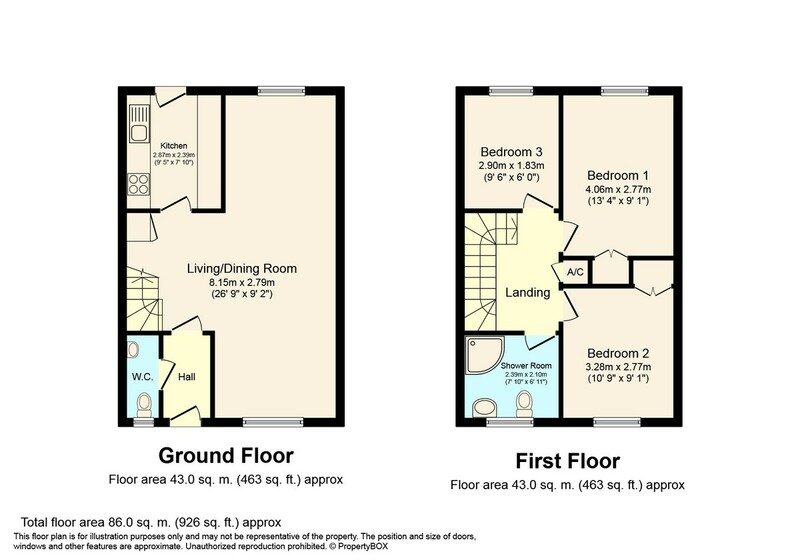 Completing the ground floor layout is the Kitchen which offers a range of floor and wall mounted units, with space for all of your appliances and a door opening to the Rear Garden. To the First Floor is a recently replaced shower room with a window and three Bedrooms, with the largest two being doubles with built in wardrobes. OUTSIDE This three bedroom family home is located in a small cu de sac, and has a front garden that is mainly laid to lawn with a well kept border and a path that leads to the front door into the rear garden. A patio, perfect for barbecues in the summer months leads on to an area of lawn with attractive borders, while at the bottom of the garden is a shed and gated rear access. There is also a single Garage located en bloc.